Former Senator Ferdinand “Bongbong” Marcos Jr. is happy to be welcomed at General Trias, Cavite. The politiko went there on February 9 to lead a medical mission. “I was with the residents of General Trias, Cavite last Saturday during our regular Medical Mission. 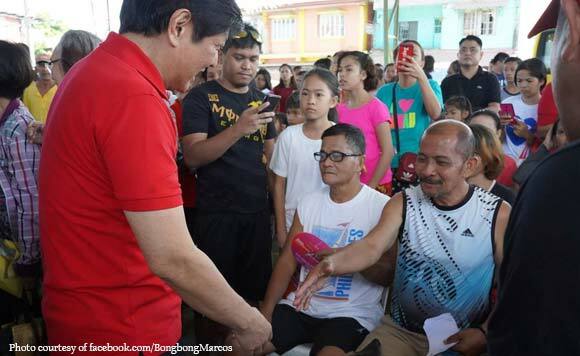 The genuine warmth of the crowd is enough reason for my too infrequent visits,” said Marcos. He then said he is “proud” for the role he played in General Trias’ Cityhood. “I am also proud to have played a part in General Trias’ Cityhood which, in time, has led to the progress and development of the city. It has now become a major industrial hub in Cavite,” said Marcos. “Maraming salamat po sa inyong patuloy na suporta! Hanggang sa muli nating pagkikita,” he added. I was with the residents of General Trias, Cavite last Saturday during our regular Medical Mission. The genuine warmth of the crowd is enough reason for my too infrequent visits. I am also proud to have played a part in General Trias’ Cityhood which, in time, has led to the progress and development of the city. It has now become a major industrial hub in Cavite. Maraming salamat po sa inyong patuloy na suporta! Hanggang sa muli nating pagkikita.